Sheets for WtF 2E games! So with Mr Gone we were hammering usefull sheets for Werewolf games lately. Here is list and I hope you like them. Unofficial Uratha sheet - Added Kuruth Limit line to Gauru form everyone forgets about. Spirts and Totem sheet - With added nice First Tounge Rank names so you will remember how Rank 6 spirits are called. Predators sheet ( and 2-page with spirits stats also ) - For all your flesh-spirits monsters like Hosts, all three types of Ridden or Idigam. Wolf-Blooded sheet - Added Tribe and Pack lines, to make clear WB are part of Forsaken society! Dark Eras Werewolf sheet - For all those that want to play in Roman or Viking Werewolf games! 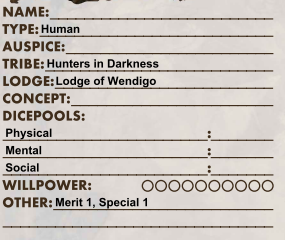 NPC 2E sheet - For all those Storytellers needing to write their condensed Uratha stats of 3 werewolves - we gotten to make place for Forms, Rites. Gifts and whole Harmony sections. Last edited by wyrdhamster; 05-18-2017, 01:03 PM. Wyrdhamster you are my hero today. Thanks for posting those up for me! Sharing goods is my speciality. With Mr Gone we made 2E sheet for use on Territories, so you all can now build your own Hunting Grounds with mentioned book. Here it is. And in this week we made NPC 2E sheet for all those Storytellers needing to write their condensed Uratha stats - we gotten to make place for Forms, Rites. Gifts and whole Harmony sections. There is nothing like proper gameplay experience - I pointed to Mr. Gone we do not have Loci sections for the Packs sheets - so we added one, making Complications part a bit smaller. Now we should have everything needed. Glad I could help! Thanks for pointing it out for me! @Mr Gone is awesome ! After some playing my own chronicles, I found out that each Pack member should have possibility to become slightly individual in long term - like getting Merits or Specializations for particular member. So asked Mr. Gone to add 'Other' section on Pack Sheet on 2nd page. Hopes you like it.